When it comes time to redesign your kitchen, you can count on having a lot of fun. The only real problems are where to start and being sure to remember every step. Today we will give you some simple tips for making your kitchen redesign a smashing success. Measure – Measure your kitchen area and record the numbers on paper. You need to know how much space is available for appliances, cabinets, islands, and so on. Triangle – The kitchen triangle, as discussed here previously, is an important part of kitchen design. Form your triangle on paper and then design around it. Access – Access points should be clear and easy. The kitchen is a heavy traffic area, so make doorways easy to navigate. Storage – Cabinets and cupboards are eye catchers, so choose your storage items now. Take your time choosing because you will have these cabinets for a long time. Appliances – Appliances can be chosen before storage options, but since most people prefer cabinets as signature items I placed appliances after storage. When choosing appliances, be sure you have enough space for them. Even two inches can turn a dishwasher into a paperweight. Work Area – The work area is where you will spend most of your time in the kitchen. Make sure there is plenty of space, both to work and move. 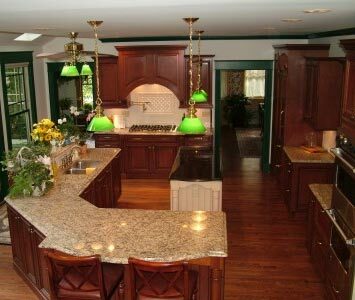 Include plenty of lighting in your plans and consider materials that resist stains and damage (granite countertops and islands are excellent choices). Sink – The kitchen sink is the forgotten piece of most renovations. After all, sinks are not fabulous eye catchers. Just remember that you will also be spending time at the sink with your pots and pans, and you can make cleaning easier with a little bit of planning now. Second Kitchen – If you have the room, a second, smaller kitchen is a grand idea if you like to entertain. Just imagine family get togethers (Thanksgiving, Christmas) without having 4 cooks squeezed into one kitchen. Keep these tips in mind and you should have no trouble designing your new kitchen. If you are still having trouble, don’t hesitate to consult your kitchen renovation professionals. If you love the way your new kitchen looks, you might want to preserve those new kitchen looks with a photo album from the top Outer Banks Wedding Photographers. An album will also serve as a guide to how your kitchen has changed over the years.